It's late afternoon in Gulf Islands National Seashore. Along some 20 miles of pristine ocean-front beaches here in northwest Florida, the water is crystal clear; one can wade into gentle surf to peer down at starfish and sand dollars. Pelicans and sea gulls wheel across the sky. Dolphins pop up above the waves, their sharp dorsal fins silhouetted against a horizon where the turquoise Gulf of Mexico meets an iridescent blue sky. The unspoiled shoreline is virtually unaltered from the time Spanish explorers first made landfall here nearly five centuries ago. Yet this marine wilderness lies only a few minutes' drive from the center of Pensacola, the lively and historic city of 56,000 at the westernmost tip of the Florida panhandle on the border with Alabama. Pensacola boasts a surprisingly little-known past: it is the site of the nation's oldest European settlement. This year, the city is marking its 450th anniversary with an ongoing birthday bash. "No matter when visitors show up, we'll be throwing a party," says Laura Lee of the local visitors bureau. "My favorite, Fiesta Days, honors the founding of Pensacola." The festival, June 4-11, will feature parades and historical reenactments. Another highlight was the arrival this past February of King Juan Carlos I and Queen Sofia of Spain. 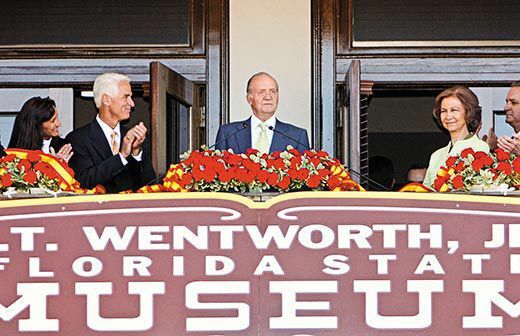 Flanked by Governor Charlie Crist and before a crowd of 3,000, the Spanish monarch lauded the heritage of a city "which contains so much of the shared history of Spain and the United States." 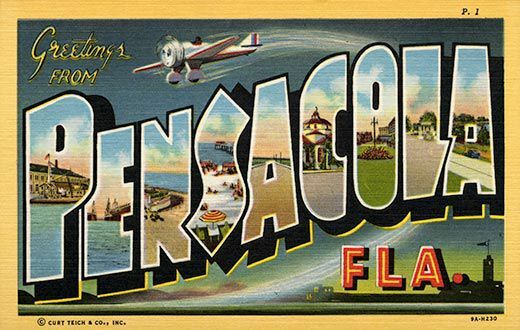 It's all Pensacola's way of drawing attention to a largely forgotten chapter in American history. In August 1559, Spanish explorer Tristán de Luna sailed into what would one day be known as Pensacola Bay. (A local tribe called the region Panzacola, perhaps meaning "long-haired people," as the indigenous inhabitants may have been known.) Spain's viceroy of Mexico, Luis de Velasco, had charged Luna with establishing a settlement on the bay, reconnoitered by Spanish navigators the previous year. Nearly a century later, Mexican scholar Carlos de Sigüenza y Góngora would describe Pensacola's natural harbor as "the finest jewel possessed by His Majesty...not only here in America but in all his kingdom." Luna commanded a fleet of 11 vessels and some 1,500 settlers, including African slaves and Mexican Indians, many of them craftsmen. "Here in Pensacola, three distinct cultures arrived in North America at the same time," says James M. James, the former executive director of the African American Heritage Society, a local nonprofit organization. "That's very unusual in U.S. history, but it's also just how things were—and still are—in Pensacola. We've always had different cultures living together in this beautiful place." Luna's contingent arrived in Pensacola six years before Adm. Pedro Menéndez de Avilés reached Florida's Atlantic Coast, where he would found St. Augustine, still widely regarded as the oldest city in the United States, probably because the Menéndez colony endured. 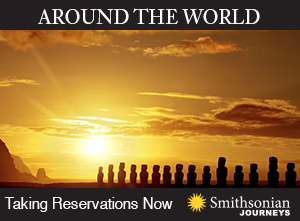 (Columbus never reached what would become the United States.) Luna's colony would not fare as well: on September 19, 1559, only weeks after he dropped anchor, a powerful hurricane blew in from across the bay, sinking all but three of Luna's ships. By preventing the Spanish from establishing a foothold in western Florida, says local historian and author John Appleyard, "that storm changed history." Luna dispatched a remaining ship to Veracruz, Mexico, in hopes of enlisting rescuers. 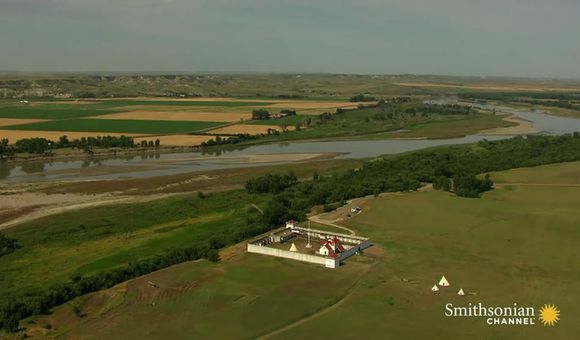 For more than a year, the settlers hung on, their numbers and stores dwindling. At last, some vessels arrived to transport survivors to safe haven in Havana. By spring of 1561, only a military outpost remained; in August, its handful of soldiers abandoned the site and returned to Mexico. It wasn't until 1698 that Spain established another garrison in Pensacola, where soldiers began to lay out a colonial town. In May 1719, Spaniards in Pensacola surrendered to the French, who were at war with Spain. Over the next century, a succession of competing powers—French, Spanish, British, then Spanish once more—would plant their flags in Pensacola sand until, in 1821, Spain ceded Florida to the United States. 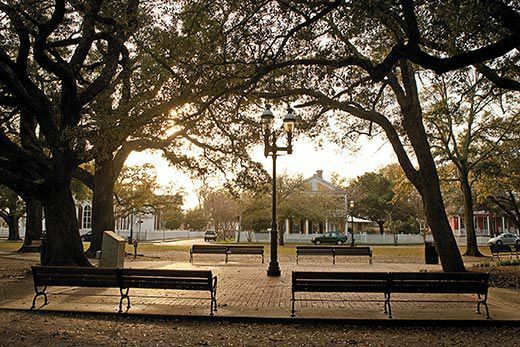 Today, a historic district of parks and plazas roughly 40 blocks square, shaded by old live oaks, reflects the city's diversity. On streets that recall New Orleans' French Quarter, early and mid-19th-century houses, constructed of brick or stucco and replete with intricate ironwork verandas and interior courtyards, reflect Spanish and Gallic influences. After succeeding the Spanish in 1763, the British built cottages of traditional timber, clapboard and brick and laid down the street grid visible today. The heart of the old colonial downtown is Palafox Street, running through its center and now boasting a mix of trendy shops, restaurants and galleries.The town's original wharf was at one end of Palafox, according to Tim Roberts, historic preservationist for the historic quarter. 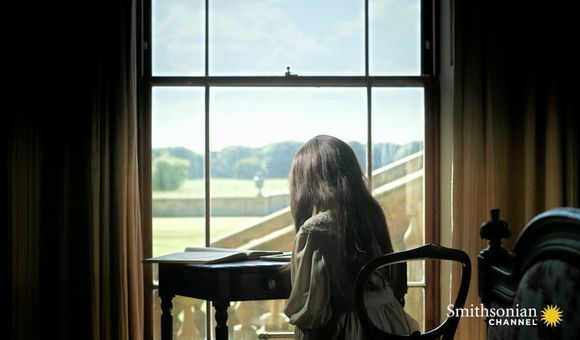 Pensacola's rich history has spawned a passion for the past. 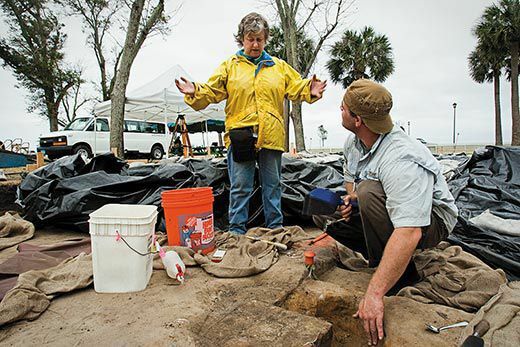 For more than 20 years, archaeologists from Pensacola's University of West Florida have conducted digs at several city sites. Since 2006, the Florida Public Archaeology Network (FPAN), an education and outreach organization, has also participated in excavations. It's not only scientists who are at work: volunteers—locals and even tourists—can sign on to help for a day or a decade. Twice weekly, FPAN staff offer training in the processing of artifacts. "Even if you have only a few hours to volunteer, we can put you to work: screening dirt, washing artifacts, sorting them. We want people to engage their past," says archaeologist Della Scott-Ireton, director of FPAN's Northwest Regional Center. Says University of West Florida archaeologist Margo Stringfield, "With all this history we've yet to uncover, there's still a lot of work to do." At St. Michael's Cemetery, an eight-acre oasis of calm dotted by magnolia trees and crisscrossed by gravel paths, archaeologists are using ground-penetrating radar to map sites of the deepest, oldest graves, most of which are unmarked. The Spanish began conducting burials as early as the mid-1700s at the site, where, evidence suggests, colonialists and slaves lie side by side. (Because the cemetery is still in use, only limited excavations are allowed. 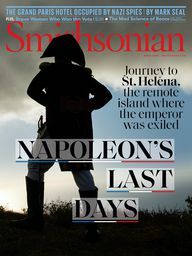 Archaeologists, however, analyze artifacts as they surface—for example, during storms trees have been uprooted, revealing cannonballs and grapeshot.) That is "one of the great things about living in a city this old," says Stringfield. "You're reminded that history is very much still with us." 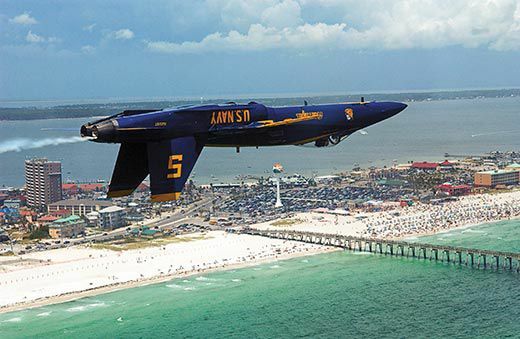 In 1914, the U.S. Navy constructed a new installation, the Pensacola Naval Aeronautical Station, on the grounds of a U.S. naval shipyard on Pensacola Bay. (President John Quincy Adams, recognizing the bay's strategic potential, had ordered the establishment of the shipyard in 1825.) At any given time, some 12,000 active military personnel are assigned to today's Naval Air Station, 9,000 of them in aviation training. The Air Station is also home to the National Naval Aviation Museum, dedicated to Navy, Marine Corps and Coast Guard flight. The 300,000-square-foot complex, where one can stroll through a recreated World War I aviation camp or sit in the training cockpit of a Vietnam-era Sea Cobra helicopter, houses more than 100 vintage aircraft. "One of my favorite things here," says museum volunteer coordinator Phil Duryea, "is an inflatable aircraft made by Goodyear in the 1950s. It all came packed inside a single crate, complete with an engine and an inflation compressor. If you were a pilot downed behind enemy lines, we'd drop this aircraft to you in a crate on a flyover, and you'd spread it out and inflate it—and fly away to safety. It's pretty amazing." Not long ago, Duryea led some of Jimmy Doolittle's Raiders, the B-25 bomber crews who took off from the aircraft carrier USS Hornet in April 1942 to attack oil and navy installations in Japan. "As I was telling them about the museum," Duryea says, "they were telling me about what it had been like to fly the first raid on Japan." Still, Pensacola isn't all history-steeped excursions or placid beaches. Several miles west of downtown, on a barrier-island strip of sand, Perdido Key, lies another local landmark. The Flora-Bama (for its location at the Florida-Alabama state line) restaurant is perched between the island's lone strip of highway and a beach where the sand is white as sugar. 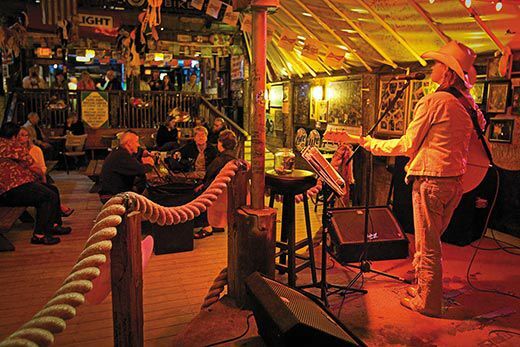 At the jumble of shacks connected by roofed walkways, where the good times have rolled since the 1960s, bands on multiple stages are a nightly draw and the menu features fresh-shucked oysters and spicy boiled shrimp. "You know the magazine Bon Appétit?" asks Pat McClellan, one of Flora-Bama's owners. "Well, they listed us as one of the best over-the-counter restaurants in the country. I figure they must have had a few beers and soaked in the atmosphere, and that's what swayed 'em. We do concentrate on the freshest seafood available anywhere, though. So if it was fresh seafood they were after, we got that covered." On a recent afternoon, in the midst of the Flora-Bama's laid-back chaos, a couple of sky divers suddenly plummeted out of the sky to land on the beach. Folding their parachutes into jump harnesses, they ambled across the sand to place an order at the bar, still wearing their jumpsuits. No one looked twice. 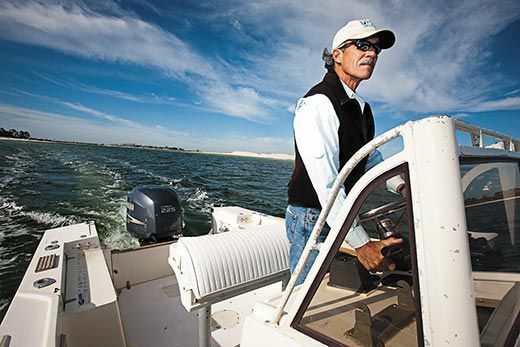 "You know, you can get any water or beach experience you want around here," says local fishing guide Baz Yelverton. 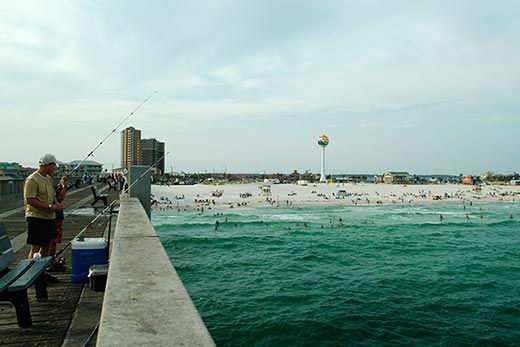 "You can fish the surf or the points where Pensacola Bay runs into the Gulf of Mexico. Farther north and east, freshwater creeks and rivers are running into the bay. That water is clean, nutrient rich and full of life." We're aboard Yelverton's 21-foot outboard motorboat near the mouth of Pensacola Bay, in search of redfish and false-albacore. Beneath a cloudless blue sky at dusk, with virtually no one visible on nearby stretches of beach, the water glimmers a translucent aquamarine. The beaches are so pristine that four of the world's seven species of sea turtle nest here. Yelverton, a local lad who had a successful career as a laboratory supplies executive in California and Seattle, returned to Pensacola 20 years ago. "I came home," he says, "and it was the best decision I've ever made. Every day, I get to come out into this huge wilderness. There's always something new going on out here." As if on cue, a pair of fighter jets roars into the sky from the Naval Air Station. The sleek aircraft glint in the sunset as the shimmering twilight flatness of the Gulf spreads out ahead of us. "See what I mean," Yelverton adds. "On Tuesdays and Thursdays, all summer long, the Blue Angels [the Navy's aerial demonstration squadron] are out here, practicing their precision moves right over our heads as we fish." He pauses, gazing at the horizon. "To be out here while that's going on," he says, "well, that's pretty darned cool." Writer Donovan Webster is based in Charlottesville, Virginia. 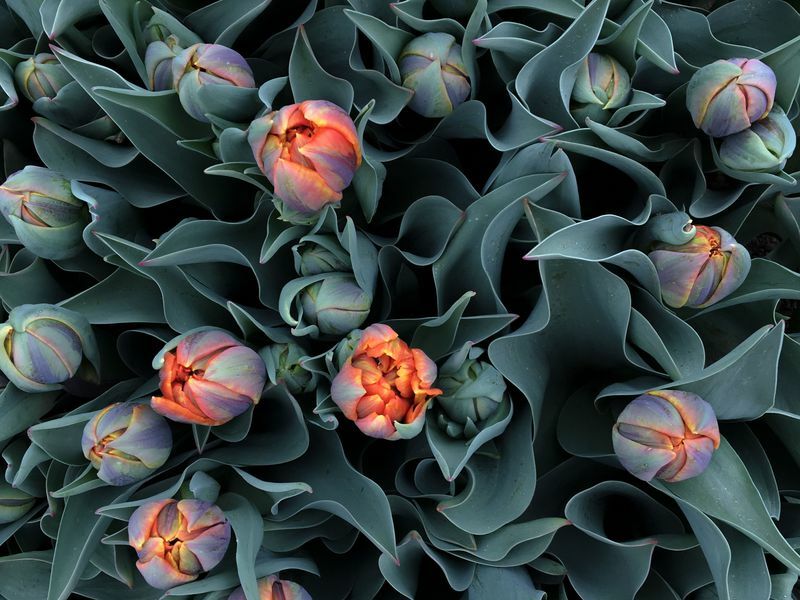 Photographer Lee Celano lives in New Orleans. Donovan Webster is a journalist and author. He writes from Charlottesville, Virginia.